The above photograph shows typical moulded insulation covers manufactured at their 52,000 sq. Mtr manufacturing facility. Many of the patterns are produced by injection moulding PU in a large ‘book-press’ plastic injection moulding machine, which has two large platens that open just like the covers of a book. The platen can be seen here with grid holes used for mounting the mould cavities. Both male and female mould cavities are bolted in place with connections at the top through which the molten PU is fed. Before moulding a mould-release is sprayed onto the mould cavities to prevent the material sticking to the mould tool after moulding. This spraying operation was performed manually using two spray cans, one in each hand, and respiratory protection was required. 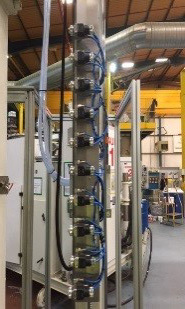 The customer preferred this to be automatic to speed up the operation, reduce wasted mould release, reduce overspray and aerosol, and for health and safety conditions. Sealpump Engineering welcomed the opportunity to investigate the requirements and propose a spray solution. 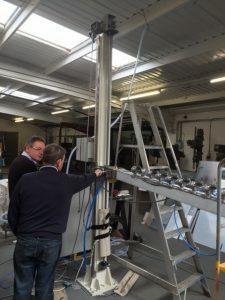 Sealpump Director, Stuart Brown, involved all the technical team to examine the existing system and to test various spray nozzles to propose a design which would achieve the customer expectations. 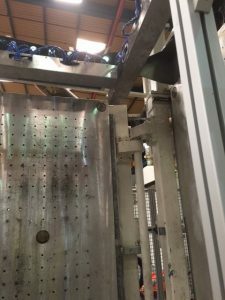 During initial discussions with the Engineering Manager, it was agreed that the function of the book press would be combined with the operation of the sprays and total control would be incorporated into a single control panel. This involved a thorough understanding of the moulding operation, prior to designing the spray solution, and involving many extra safety features. Once the fundamental operation was designed, the automation of the sprays needed studying. Initially, Malcolm Ledger (UK Sales Manager at Sealpump), considered a robot, and this was investigated. However, due to certain complications with this method and the cost involved – particularly the cost of programming, this was dismissed and automated spray booms were finally chosen. Spray trials, using the mould release chemical, were conducted at Sealpump Engineering’s test facility at Redcar and finally the Walther Pilot* WA900 spray gun was chosen. This spray gun provides the controllability and versatility required for varying the spray volume and spray pattern. 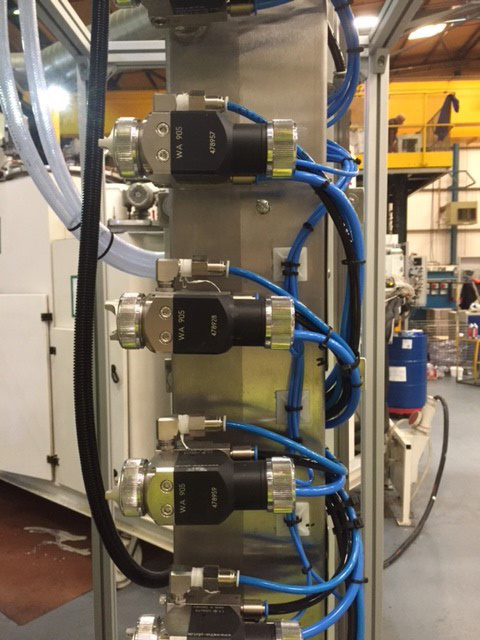 In order to ‘zone’ the sprays to suit various sizes of mould cavities, a total of 10 nozzles were fitted onto each spray boom. This number of nozzles was designed to provide optimum coverage, minimum overspray, and improved spray distribution. Here, the leg which holds the spray boom is being built. The leg is bolted to the floor and the spray boom (arm) is folded parallel to this prior to operation. When required the arm raises to 90-degrees to the leg (as shown) and parallel to the mould tool. The arm is positioned at the top of the mould tool and gradually descends down the mould tool face, spraying the mould release. The number of nozzles actually spraying is predetermined depending on the mould tool size. Additionally the volume and spray pattern can be individually pre-controlled from the control panel. The rise and fall of the arm is performed using a ball screw arrangement, which has proved efficient and accurate. The ten nozzles shown in the vertical position. A close up of the sprays mounted onto the arm with liquid and air connections. The tubes are routed through the arm and finally enclosed with a stainless panel for concealment and protection. The whole scope of supply for Sealpump included the method of liquid delivery, which consisted of a 45-litre pressure vessel* with auto-fill facility. This is controlled from the panel. When a low-level is sensed, an air driven pump commences re-fill from an IBC. Subsequent to final installation, an agitator* has been retro-fitted to the pressure vessel to maintain product stability. 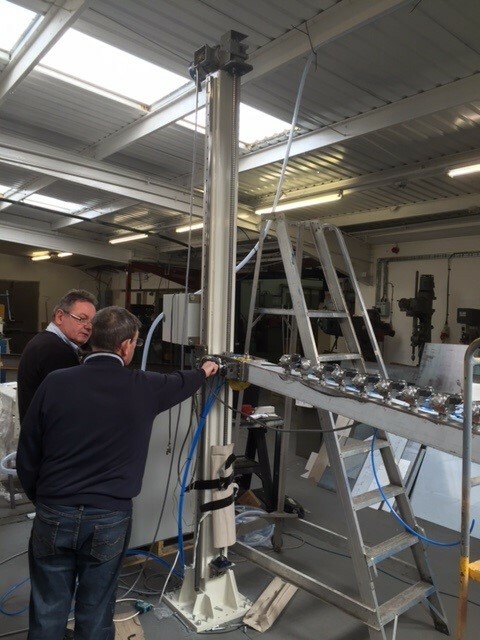 The design, manufacture, build, test, installation and commissioning was completed by Sealpump Engineering’s own technical support team. *Products supplied via Spray Direct Ltd – A sister company Of Sealpump Engineering and Authorised Distributor of Walther Pilot Products.